The Angriest: Doctor Who: "The Slave Traders"
It is 16 January 1965, and time for another episode of Doctor Who. A month after the TARDIS makes a crash landing in Ancient Rome, the Doctor (William Hartnell) and his companions relax in a nearby villa. When the Doctor and Vicki (Maureen O'Brien) head off to visit Rome, the Doctor finds himself mistaken for a murdered musician. Back at the villa Ian (William Russell) and Barbara (Jacqueline Hill) are ambushed and captured by slave traders. There is something genuinely delightful about "The Slave Traders", the first episode of Dennis Spooner's historical serial "The Romans". A lot of the appeal comes from seeing the regular characters actually getting to stop for a while and relax. They have rampaged from one adventure to the next for a series and a half at this stage, and have more than earnest a rest. That rest comes with a huge boost in warm humour: it seems clear at this stage that Ian and Barbara are actively enjoying their travels with the Doctor. New companion Vicki has slipped comfortably into her new routine. The one-month jump in time actually benefits her introduction enormously because she is now happily familiar with her new friends. It is a great narrative shortcut. As with all Doctor Who historicals, the episode is beautifully designed and costumed. It is tremendous to realise just how much period detail had been generated on such comparatively tiny sets. The regular cast look fantastic in their Roman garb. 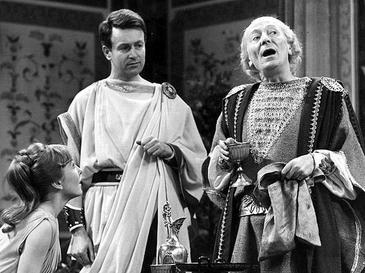 William Hartnell looks tremendously dignified, William Russell looks the perfect Roman once Barbara has a cheerful go at Ian's hairstyle, and Jacqueline Hill has never looked so radiant. The comedic elements of the episode are a wonderful change. Ian and Barbara's banter makes it pretty clear that the two have entered into a romantic relationship during their travels. Vicki is making an excellent impression as a much brighter, happier companion that Susan ever was. The Doctor is tremendous; William Hartnell rarely got the chance to play comedy, having spent most of his career as stern authority figures or menacing gangsters. He is visibly having a ball playing with lighter material. There is a purpose to the comedy, however, because it lightens the mood in an episode where Ian and Barbara are assaulted and kidnapped, then taken away to be sold as slaves. At the same time the Doctor and Vicki stumble upon a dead body on the road and find themselves the target of some murderous conspiracy. Writer Dennis Spooner does not shy away from the darker aspects of Roman society, but instead softens its impact for a family audience by keeping things as light and comical as possible. It is a smart, inventive approach and has created a remarkably original and tonally different kind of episode. The quality ratio of Series 2 holds steady at 100 per cent.